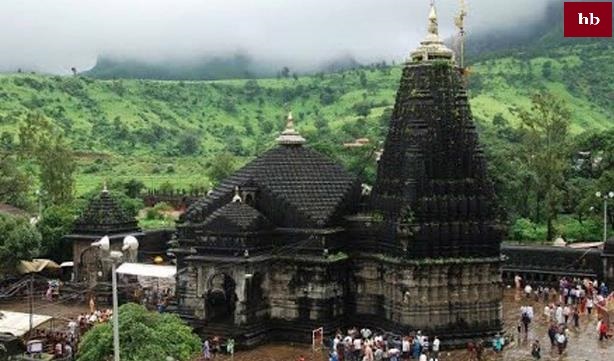 The Trimbakeshwar Jyotirlinga temple is in the Nashik district of Maharashtra state, the Godavari River originated from the mountain called Brahma Giri near here. 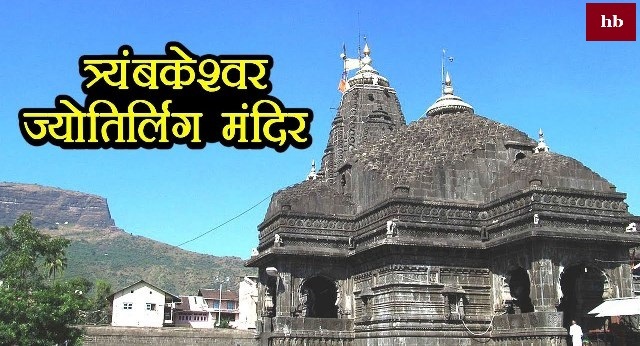 According to the prayer of Gautam Rishi and Godavari, Lord Shiva was very happy to live in this place and was known as Trimbakeshwar, in the presence of Trimbakeshwar God, which is near the place of Godavari. Inside the temple, there are three small Ditches in one small group, lord Brahma, lord Vishnu, and lord Shiva is considered symbols of these three gods. The widest seven hundred stairs are made to go above the Brahmagiri mountain of Shivpuri. After climbing these stairs, 'Ramkunda' and 'Laxmankunda' are met, and on reaching the summit, there are visions of Bhagwati Godavari, coming out of Ghumukh. Trimbakeshwar or Trimbakeshwar is an ancient Hindu temple, which is situated in Trimbak town of Trimbakeshwar tehsil, 28 kilometers from Nasik city and 40 km from Nasik road in India. In ancient times, Trimbak was the Tapo Bhabha of Gautama Rishi. To get rid of the cow slaughter of the cow, Gautam Rishi asked for a boon to cast the Ganges here. As a result, the river Ganga river originated in the South. With the origin of Godavari, after accepting the grace of Gautam Rishi, Shivaji accepted to sit in this temple. Due to the presence of Shivshambhu with three eyes, this place was called Trimbak (three eyes). 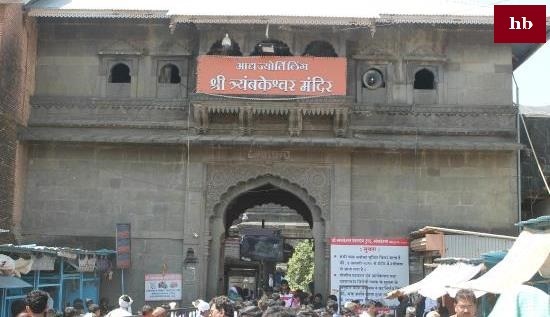 Like Ujjain and Omkareshwar, Trimbakeshwar Maharaj is considered to be the king of this village, soon every Monday; the King of Trimbakeshwar goes out to visit the city to know his subjects. Once, the wives of the Brahmins living in Tapovan of Maharishi Gautam became angry with his wife Ahilya on some matter. She inspired her husbands to torture Gautam Rishi. Those Brahmins worshiped Lord Shree Ganesha for their sake. He is Happy with his worship; Ganesha came forward and asked him to ask for a favor. Those Brahmins said, 'Lord! If you are pleased with us, then somehow, remove the Saint Gautam from this ashram. ‘Upon listening to this, Ganesha explained to him such a plea. But they remain firm on their insistence. Eventually, Ganesh ji had to comply and follow his advice. To keep the mind of his devotees, he took the form of a weak cow and started living on the farm of Gautam Rishi. Seeing the cow grazing in the crop, the sage took a trunk in hand with a great humor and kept it hidden in him. As the tigers touched them, that cow fell down there only. Now it is a big hit. All the Brahmins will be gathered together as a murderer, and they are condemning the guru. Gautam Rishi was very surprised and sad from this incident. Now all those Brahmins said that you should leave this ashram and move away elsewhere. Staying close to the murderer will also cause us to sin. Being constrained, Gautam, with his wife Ahilya, went a distance away from there. But those Brahmins also filled their lives there too. They started saying, 'You have no right to do any work of Vedas and Yagya, because of the killing.' With utmost persuasion, Gautam Rishi prayed to the Brahmins that you people should give me a remedy for my repentance and salvation. Then he said, 'Gautam! Three times you revolve around your whole earth orbiting your sins. Then come back and fast for a month here. After this, you will be purified after doing '101' or 'Brahmagiri' or you can take Shivaji's help from one crore pilgrims. After this, after bathing in Gangaji, do this Brahmagiri orbiting 11 times. Then bathing the Parthiv Shivalans with the sacred water of hundred cubes will give you salvation. Maharishi Gautam said on this, Lord! I have received your sight from them for the sake of them. Now, do not be angry with them as they think of me as my paramount. ‘Many Rishis, Munis, and Dev Ganes gathered there to pray for Lord Shiva to dwell there. Considering their point, they were named after Trimbakeshwar Jyotirling. Gangaji brought by Gautamji also started flowing in there by the Godavari. This Trimbakeshwar Jyotirlinga is going to provide all virtues. This temple is dedicated to Lord Shiva, as well as one of the 12 Jyotirlingas of Lord Shiva, where the genealogy of Hindus is also registered. The origin of the river Godavari is also near Trimbak. The holy Kusvarda Kund is also in the temple premises of the longest river Godavari of Peninsular India. 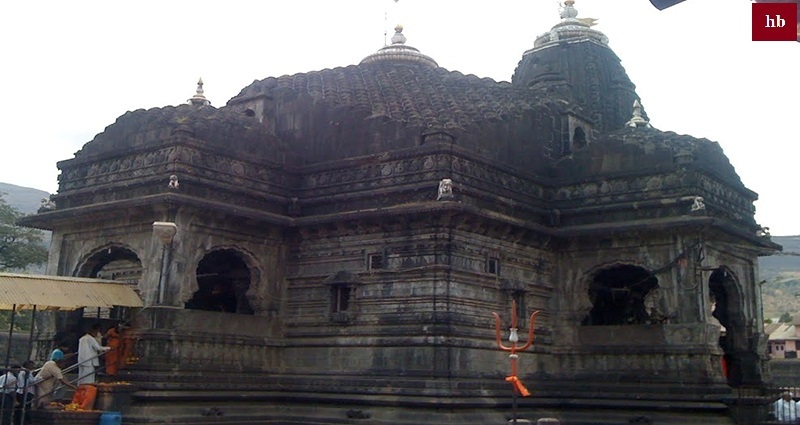 Trimbakeshwar is a religious place and one of the 12 Jyotirlingas of Lord Shiva. 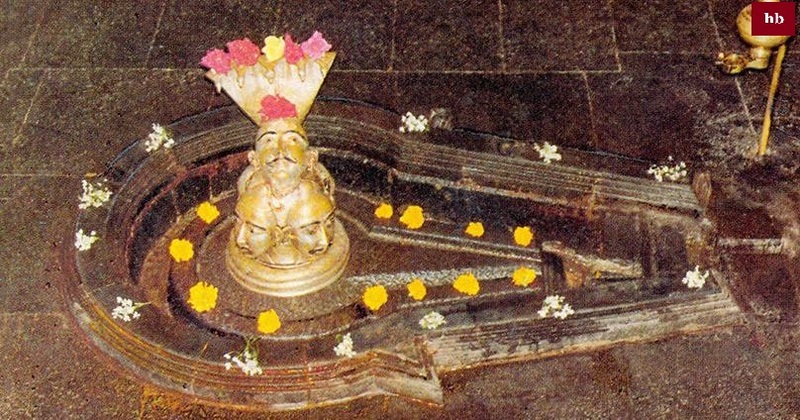 In Trimbakeshwar we find the body of the three faces Lord Shiva, which represents Lord Brahma, Vishnu, and Rudra. With the excessive flow of water (use) the body of the body is slowly disappearing. It is said that erosion of body represents the destruction of human society. The gender found here is decorated with a crowned crown, which was first offered on the head of Tridev (Brahma, Vishnu, and Mahesh). It is said that this crown is plated from the time of Pandavas and in this crown there are diamonds, jewels, and many precious stones. This crown of Lord Shiva is kept for showing the people every Monday between 4-5 PM. In other Jyotirlingas of Lord Shiva, Lord Shiva is worshiped as the main deity. The temple of Kedarnath is completely made of black stones. It is said that it has been constructed from Brahmagiri's attractive black stone. The origin of the Godavari river originates from the Brahmagiri hills. Shri Nilgiri / Dattatray, Matumba Temple: This temple is at the top of the Neel Mountain. It is said that all the Goddesses (Matamba, Renuka, and Mananamba) came here to see the penance of Parasurama. After worship, Parshuram prayed to the three ladies that they remained the same and only the temple was set up for the Goddess's living. Lord Dattatray (Shripad Shrivallabh) stayed here for some years, along with the Nilkantheshwar Mahadev ancient temple on the right side of Dattatray Temple and Annapurna Ashram, Renukadevi, Khandoba temple also on the bottom of the Nil Mountain. At one kilometer away from Shiva temple, the entire Indian Shri Swami Samarth Gurpith, Shri Swami Samarth Maharaj's Trimbakeshwar temple has remained. This temple is one of the best examples of Vastu Shastra. Almost 500 years ago, a city was built here, which later became known as Trimbakeshwar. During Peshwa's reign, the construction of the Trimbakeshwar temple and the development of the city of Trimbakeshwar were planned and the work was also started. Brahmagiri Mountain, 18 km from Nashik city of Nashik district. It is only a part of Sahyadri valley. The city of Trimbakeshwar is situated in the lower part of the mountain. Due to the cold weather, its natural beauty is worth seeing and it is also situated at an altitude of 3000 feet above sea level. There are 2 different ways to go here. From Nashik, Trimbakeshwar is only 18 km away and this road was constructed in 871 AD with the help of Shri Kashinath Diet. Every day passengers from Nashik get easy access to traffic. The second easy route is the path to Igatpuri-Trimbakeshwar. But when we go this route, we have to travel a long distance of 28 km. The only limited way to get access to Trimbakeshwar is available here.